Pre-workout supplements are all the rage and have been for awhile.Â Back when I worked at Vitamin Shoppe BSN’s N.O. Explode was our most popular seller, followed right up by USP Labs Jack3D.Â N.O. Xplode got the job done but the taste!!! *shiver*Â You will literally shiver because it’s so strong. Jack3D is good too, with less bitterness and I love the fact that it has less fillers, only things that are really proven to work: Beta-Alanine, Creatine, Caffeine….you can see my take on what supplements you REALLY need here. But one supplement that has stayed with me throughout all of this is a drink called Celsius.Â I started drinking it back when it was bottled in glass bottles and they still had the Ginger Ale flavor (please make it again!Â Tasted EXACTLY like Ginger Ale).Â The product got a makeover, they bottled them in cans and sold them by the 4-pack and suddenly I’m addicted.Â I literally drink them almost every single day. Burn up to 100 calories more when combined with exercise.Â Celsius is way more than an energy drink as studies show Celsius may reduce body fat, increase endurance and provide greater resistance to fatigue (increased energy). * These were the results for participants, who drank a Celsius once a day during the 10-week study. On the days they exercised they consumed their daily Celsius 15 minutes prior to exercise. The Best Part?Â BACKED BY RESEARCH. I dare you to find another energy drink backed by research! Seven scientific studies have been conducted on Celsius by U.S. accredited scientific research facilities according to strict scientific standards. To ensure consumer confidence, trust, and industry independence, the studies were presented at scientific conferences and published for peer review. 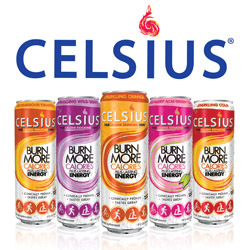 All of the clinical studies show that Celsius has thermogenic properties. Thermogenics are substances that increases metabolism and push the nervous system to be more active. This speeds up body functions such as heart rate and breath rate. In turn this causes you to burn more calories than you normally would. The increase in metabolism from thermogenics results in the body burning fat as fuel. The scientific studies were conducted on the Celsius product as a whole, not just the ingredients contained in Celsius. This is an important distinction. The multiple studies show that drinking Celsius results in burning calories and providing lasting energy. When drinking a great tasting Celsius before exercise, Celsius reduces body fat, increases endurance and provides greater resistance to fatigue (increased energy). 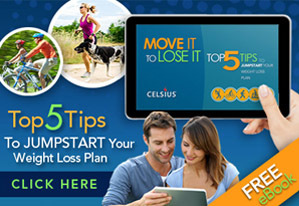 * Even better, Celsius has evidence of many consumers that have gotten real results. Read the stories from REAL PEOPLE who have gotten REAL RESULTS. Besides all this they actually taste REALLY good. The Cola flavor is unacnnily like cola, but my favorite is definitely the Sparkling Wild Berry. 4th of July Special, 35-50% OFF:Â Join our Subscribe 2 Save program and save up to 50% on your Celsius orders online. Enjoy the Fourth of July and the rest of your summer knowing that youâ€™ll never run out of healthy energy! Your Celsius order and special subscriber savings will automatically renew and be shipped to you every 30 or 60 days (your choice) until you change it. Enroll in Subscribe2Save today to burn calories, not cash!